The speaker was the Rev. Martin Luther King, Jr., in 1957, on his way to a speaking engagement in Kentucky. The song was “We Shall Overcome.” He had heard it the day before from Pete Seeger at the Highlander Center in Tennessee. There Seeger had, a decade before, learned the song — most likely derived from an old gospel song that became a labor union song by the early 1900s. 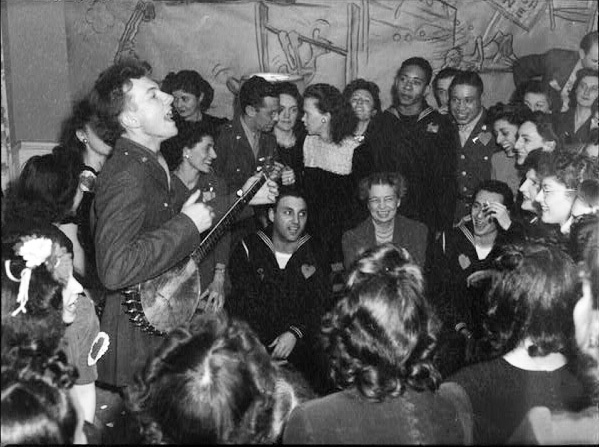 Folk singer Pete Seeger entertaining at the opening of the Washington labor canteen in 1944. First Lady Eleanor Roosevelt pictured in center. Public domain via Wikimedia Commons. Songs have the power to move people, more than words alone. Teaching people songs – and singing them together – can move people emotionally, socially, and politically. Seeger knew the power of singing to move people to help bring about progressive social change. For almost seven decades he did just that. He sang – and had people sing along with him – to rally support for labor unions, for the Civil Rights Movement, for ending the Vietnam War, for eliminating nuclear weapons, and for addressing environmental hazards. Many of the songs that he sang were derived from the Bible, traditional rural American folk music, or the musical culture of other peoples and countries. He used singing to teach, to inspire, and to build community. And he used singing to help build social movements. Asked how he would like to be remembered, he replied: “He made up songs to try and persuade people to do something.” Indeed he did, and very effectively. 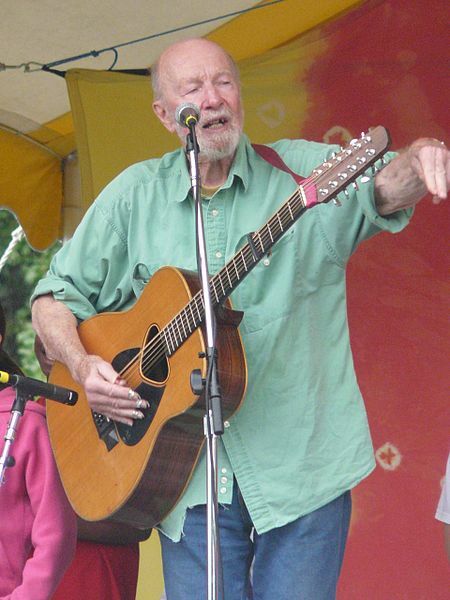 Pete Seeger in 2008. Photo by Dan Tappan 2008. CC-BY-SA 2.0 via Wikimedia Commons. Barry S. Levy, M.D., M.P.H., and Victor W. Sidel, M.D., are co-editors of the recently published second edition of Social Injustice and Public Health as well as two editions each of the books War and Public Health and Terrorism and Public Health. They are both past presidents of the American Public Health Association. Dr. Levy is an Adjunct Professor of Public Health at Tufts University School of Medicine. Dr. Sidel is Distinguished University Professor of Social Medicine Emeritus at Montefiore Medical Center and Albert Einstein Medical College and an Adjunct Professor of Public Health at Weill Cornell Medical College. Read their previous OUPblog articles.